Home › Beach › P-p-p-pick up a penguin on World Penguin Day! 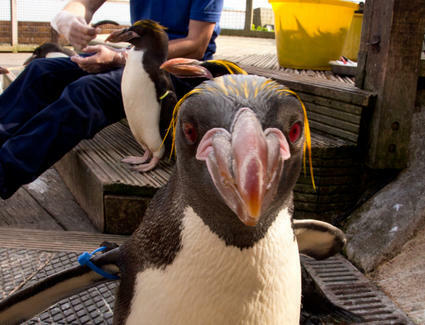 Living Coasts is an all-weather attraction, located on Torquay seafront in South Devon. There’s always plenty to see and do – mingle with the playful penguins, get up close to the otters, octopus and seals, and much more. Visit Penguin Beach to walk with the African and Macaroni penguins and catch the entertaining feeding time talks. Below the decks the fun doesn’t stop, with more fascinating habitats and creatures in the aquariums, games, activities and panoramic underwater viewing areas for the diverse array of stunning species. Open to all, the Living Coasts Café has free entry to non-visitors too, so go in anytime for family friendly, local food and drink with panoramic sea views overlooking the Bay. You can also grab some retail therapy at Tradewinds Gift Shop anytime without having to visit the zoo. It’s packed with wonderful products to suit all ages, from plush toys and games to books, clothing and confectionary. There’s also a huge range of Fair Trade jewellery and local art. All profits go towards their conservation work. Today, 25th April, is World Penguin Day! Why not visit Living Coasts to help celebrate these amazing birds. There will be a puppet show at 14:50, Mac the Penguin mascot will be doing his rounds twice on the day. There will be lots of penguin things going on, penguin touch trolley, games and enrichment for the penguins too with the bubble machine and disco ball – they love a bit of sparkle!